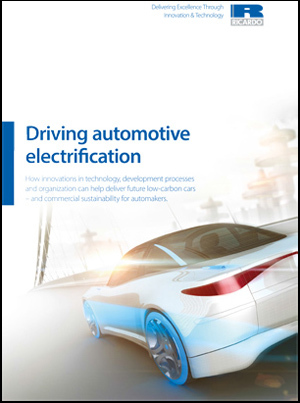 In a strategic white paper published today, experts from across Ricardo set out their vision for an electric future for the passenger car, in which innovations both in technology and in the processes and organization of product development can successfully deliver both environmental and commercial sustainability for the automotive industry. Whether through hybridization or substitution with pure battery-electric architectures, the trend towards the electrification of passenger powertrains is now firmly established, as automakers strive to meet fuel economy and CO2 emissions targets. The Ricardo white paper published today, Driving automotive electrification, draws on the skills and experience of experts from across the Ricardo group – in addition to a wide range of external sources of data and information – to present a detailed analysis of the current global passenger car market and how this is likely to develop over the next decade and beyond. The clear conclusion of the market projection presented in the paper is that further significant increases in electrification over and above the levels of today are effectively essential if US 2025 CAFE, EU targets for 2021 and China Phase 4/5 are to be met. And to achieve these and likely future targets, a new level of market penetration for electrified powertrain vehicles – substantially higher than that of today – will be required. As those customers who would be attracted to the environmental branding of such vehicle types will presumably already have switched as early adopters, it is logical to assume that – in the absence of a significant hike in fuel prices, or other direct incentives for the consumer – this shift in the market will need to be achieved on the basis of a more value-driven offering for mass, mid-market segments. Having established the likely future shape of market demand for electrified powertrain products, Driving automotive electrification goes on to examine the typical organization of powertrain product development today by the world’s leading automakers. Alternative structures and processes are then proposed, showing how product development might be adapted in the future to most effectively and efficiently meet the challenge of delivering more value-driven electrified powertrain products. By adopting the approach outlined in the paper, the authors argue that automakers will be able to incorporate the requisite skills for the electrified powertrain products of the future, while also delivering the value-based products that will deliver both the environmental goals of regulation, as well as long term commercial sustainability.